Our dog Charlie died. It is a sad time at the Spruill house, but I knew it was coming. He wouldn’t stay in the fence. He wouldn’t stay on the run. He escaped from most any collar. If he pushed his way out the door, he would take off running, ignoring our calls and whistles. He seemed to enjoy being defiant and running away. We would call for him, but he wouldn’t come. He would run all over the neighborhood. On more than one occasion, we chased him through the neighbors’ yards, trying to get him to come home. We would run after him and he would take off when he saw us coming. He was about the least obedient dog I have ever owned. And I knew that someday, it would get him killed. Two nights ago, he escaped out of the house and ran off. It was dark, so Tammy couldn’t see well enough to even attempt to find him. Nor could the driver see soon enough to avoid him when he dashed across the highway. Obedience would have saved his life. Staying within the boundaries would have saved his life. All the fences, chains, collars and schemes we worked to try to keep him safe certainly did prolong his life. But in the end, he kept insisting on having it his way, and it caught up to him. It always does. God, if there are dogs in Heaven, let Charlie be there. But just so I don’t meet him there too soon, please, keep the fences high, help me stay obedient, and don’t give up on me, no matter how dark it gets. My dog stares at my while I eat. She has no manners, no pride, and no sense of shame. She unabashedly stares and begs, watching my every move, hoping I might, by some act of particular mercy or grace, offer her a small tidbit for her eternally empty stomach. It’s very annoying. Why does she do it? Because she is a dog and that’s what dogs do. 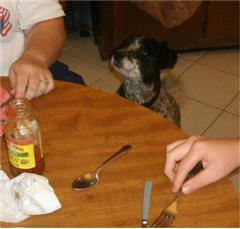 She knows that any food worth anything comes from the master’s table, so she waits and stares. Why does it annoy me? I guess because it makes me feel a little obligated to share. What I fail to realize is that she is just a dog. She does not think I am obligated to share. She just hopes I will. And so this morning she sat and waited patiently for the crust of my toast, with or without jelly. My son brought a dog home. It wasn’t his dog. He was doing a friend a favor and watching the dog for the week-end. The dog’s name was “Angel”, but she wasn’t. The dog wasn’t an angel at all. She used our floor for a bathroom several times and she did her share of whining for sure. The name did not reflect her nature. Can you imagine what our phone books would look like if people were named based on their nature? What if some great defining moment labeled you for the rest of your life? There have been cultures and times when people were named in such a way. Names had meaning. My kids know about meaningful names. In a style slightly similar to something Native American, I have assigned some special “Indian names” to our family members. Our bathroom is often occupied by “Long Shower.” “Three Alarms” is difficult to wake. And the perfect name for our dog who will eat anything and everything, “Walking Stomach.” No. Our dog would never be named Angel either. Walking Stomach fits her just fine. The name Angel should be reserved for something much better. Usually when I think of Angels, I think of beings who are messengers of God. Beings who show up and announce that something very important is about to happen. Certainly I have read many scriptures where they filled that role. However I recently read a passage that made me realize just how much of a blessing they can be. When Jesus faced some of his greatest battles, angels were there, ministering to him. At his birth, they were there. In the wilderness after being tempted, they were there. In the garden before the cross, they were there. They were there, ministering to him. Helping. Healing. Caring. Here is the part that really blesses me: If Jesus needed their care during the rough points in his life, might we not expect the same ourselves? God provided his heavenly ministers to be there when Jesus needed them most. And for those of us who call him Lord, I believe he will do no less.